Authentic French bread and melt-in-your-mouth pastries await at this newly opened French cafe. Paris Délice’s mini pastries. Click for more photos. Finally, the search for authentic French bread is over. Paris Délice, a newly opened restaurant along Makati Avenue, serves bread and pastries flown in directly from Paris. Charming café-inspired interiors, regular French clientele, and bona fide French food will make you feel like you've just stepped into a quaint coffeeshop in the city of love. The menu offers a variety of reasonably priced sweet and savory treats like croissants (P50), baguettes (P75), Croque Monsieur (P115), and a variety of quiches (P105-P115). 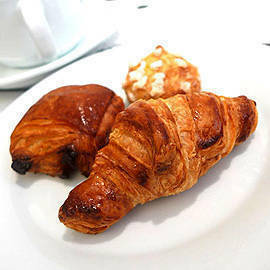 Their Pain Au Chocolat (P60) is particularly stellar, with melt-in-your-mouth chocolate housed in a crusty, perfectly buttery bread, while the Chouquettes (P25) might delight cream puff fans with its sugar-sprinkled top and lovably crunchy exterior. For those in the mood for something other than traditional French snacks, the cafe also serves sandwiches, fresh salads (served with bread and a selection of dressings to choose from) and coffee. 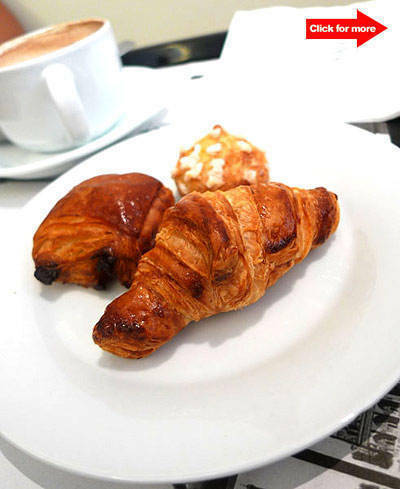 Part owner Florian Coucke explained that the reason they import their products had a lot to do with the water and humidity in Manila, which makes it almost impossible to make authentic croissants. 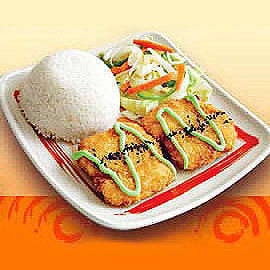 Ingredients for other dishes like salad greens and yogurt are all sourced from local organic farms. Must-tries include: Hot Crousti (P175), a sausage sandwiched in a baguette then topped with mustard, béchamel and Emmental cheese; Chocolat Beignet (P85), a Nutella-filled baked doughnut; L'Everest (P185), a cold sandwich made of arugula, goat cheese, bacon and herb dressing; and of course, the croissants, which also come in minis. What’s more: the fast food style restaurant is Wifi-enabled, plus most of the food comes conveniently pre-packed in plastic containers for those constantly on-the-go. Bon Appétit à tous!